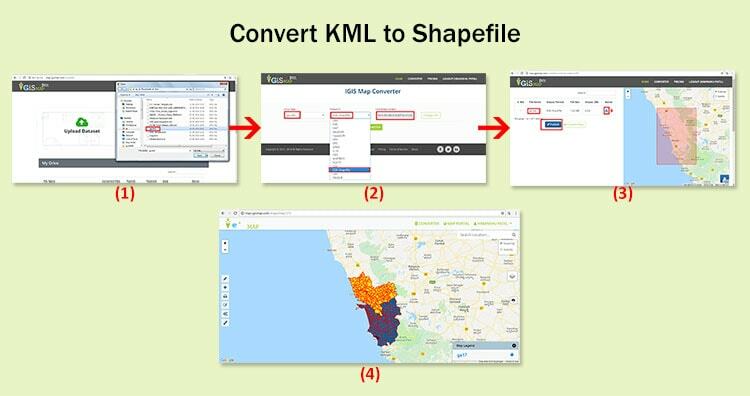 In this post we are going to discuss that how KML to Shapefile conversion can be done. KML is the file extensions used in Google applications, specifically Google Earth and Google Maps and Shapefile is a file format which is mainly used in software like ESRI ArcGIS and ArcView. Conversion Of GIS data like KML to Shapefile can be so easy with the help of online conversion tool, as We have already talked about the data conversion with the offline ogr2ogr conversion and we know how much time consuming process it is. A .KML file is a text based file composed of Tags similar to .XML or .HTML. KML data which is used in software like Google Earth and GPS devices can be converted with one click to Esri Shapefile format used in software like like ESRI ArcGIS and ArcView, With the help of IGIS Map Converter. IGIS Map Converter also supports more other vectors and rasters GIS/CAD formats and more than 4000 coordinate reference systems. If the coordinate system of your input data is not present or not recognized correctly, it is possible to assign the correct one. IGIS Map Converter makes it possible to transform your data to any other coordinate reference system. Here are some of the main process in converting KML to Shapefile using IGIS Map Converter. Go to IGIS Map Tool login if already registered otherwise sign up. Tap on switch to button on top right side, drop down list will open then choose converter shown in below screen. After clicked on convertor , GIS Convertor page will open then just drag or upload your KML file from your system or access the file from Google Drive or Dropbox. Once the file upload is completed, select the output file format we want to convert it into i.e. Esri Shapefile. and for setting up the conversion process set the Coordinate Reference System accordingly and Convert the file. Now we have successfully converted KML to Shapefile, Now you can download the file and shapefile will publish on map to see the content in the file or to check the conversion. You can also search locations, add new datasets, edit layers and style the map according to your choice and requirements. As IGIS Map Converter Tool provides many benefits other then just conversion of data. This tool provides us to generate this published map in PDF or as image format.